Chris Gayle is back in the team for the only T-20 match against India. But Team India still look stronger than West Indies team. Team India won the five matches ODI series by 3-1 and India would like to make a great end of the tour by winning the T20. 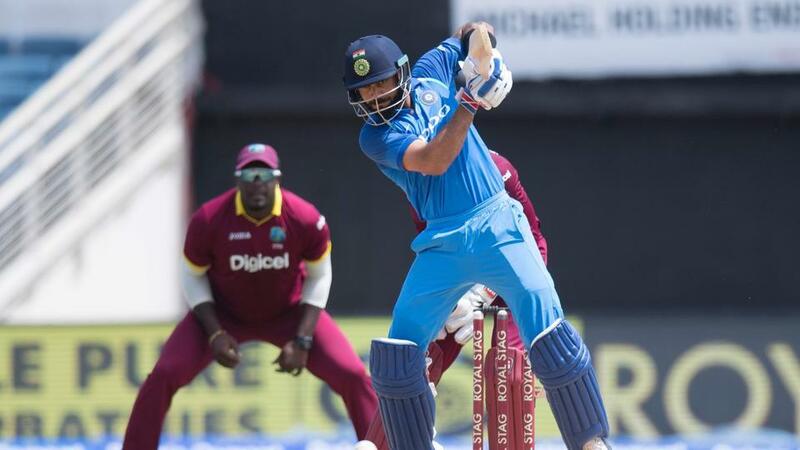 Captain Virat Kohli may start the innings with Sikhar Dhawan. If India has to ensure victory, then team India will have to take the wicket of Universal Boss (Chris Gayle) early. The West Indies are the current T-20 World Champions and their team has match winners like Gayle, Marlon Samuels, Sunil Narine, Samuel Badri, while T20 World Cup hero Carlos Braithwaite is the captain. Ajinkya Rahane performed very well in the ODI series and he scored 350 runs, including a century and three fifties. Since it is a T-20 match, Shikhar Dhawan and Kohli may start the innings. Rishabh Pant may get a chance against West Indies on Sunday. Bhuvneshwar Kumar, who has taken the most wickets in the IPL, will take charge of fast bowling with Umesh Yadav. West Indian attack will depend on Sunil Narain and Samuel Badri, who can disturb Indian batsmen from their variety.